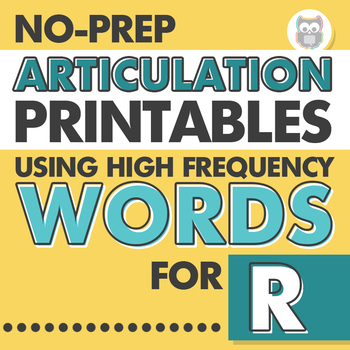 Would you like to target functional, high frequency words in your articulation therapy? This resource will help you target words your students actually use like "really" and "are" instead of random, noun-based targets like "rooster" or "monster". Check out the second preview image to see an entire word list! 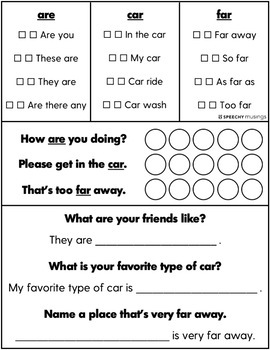 This resource includes printables to target R in isolation, syllables, words, phrases, sentences, and in reading! 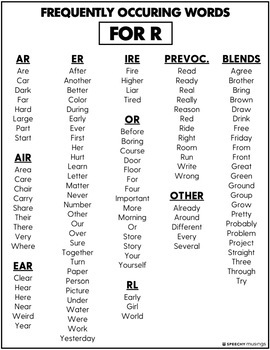 There are targets and worksheets including for all forms of /r/ including: ar, air, ear, er, ire, or, rl, prevocalic /r/, and /r/ blends. 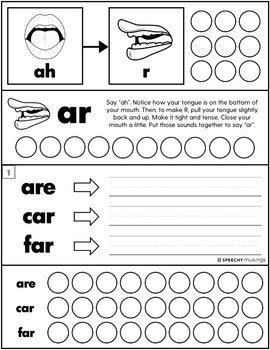 The worksheets work incredibly well for short, drill-based articulation sessions as well. Most of the pages are in black & white for easy printing with the exception of the pages the utilize real pictures and the colored binder cover pages. Because of the target words used in this product, there are not pictures or clipart of each word. Instead, there's a focus on literacy! PLEASE DOWNLOAD THE PREVIEW prior to purchasing to get a better understanding of the types of worksheets that are included. If you have any questions about this packet, please email me at speechymusings@gmail.com and I'll get back to you as soon as possible.